We live in a snow belt, 21 miles from the nearest town. Our property butts up against the Flathead National Forest, so it seems as though we own thousands and thousands of acres. What I see from my office window this morning: three feet of snow, forest, and higher mountains to the west. And it’s snowing. 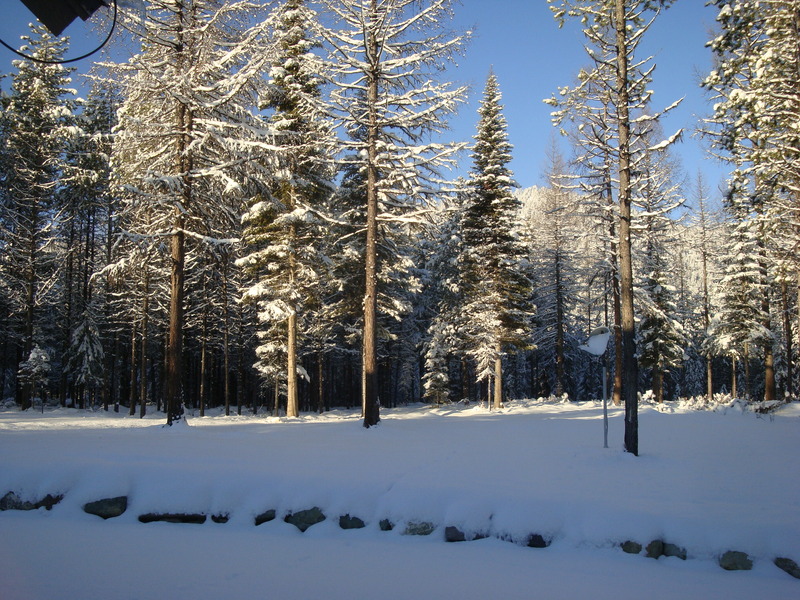 I thrive in the quiet, the isolation, and even the long dark nights of Montana’s winter—great ambiance for writing. However, we are far from alone up here. An amazing community of like-minded folks has sprung up within a mile radius. Some of us are year-rounders, some not. We have neighborhood gatherings, and we leave each other alone. We are self-sufficient, and we help one another. We are retired seniors, and some are just starting families. Coming from the big city where I knew the couples who lived on either side of our house and no one else (until I had a garage sale before moving), our community both worries and delights me. I find solitude and a close spiritual connection in this wilderness, but I was more isolated in the big city. This entry was tagged community, isolation, Montana, wilderness, Winter. Bookmark the permalink. Well said, Ann. My sentiments exactly.